You can learn more about the bears at Bears On Ice 2000. Their biographies appear there. 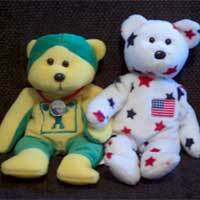 The Geobears, OzGold and Berkley, welcome you to their polar adventures page. They have gone on two adventures that we have documented here. The first was on a ship, the Aurora Australis, that made port at several Australian research stations in Antarctica. The second was by air to Summit Camp, Greenland. They have provided photojournals and information about their trips and the work of the scientists and crews they accompanied.